Despite sub-freezing temperatures and some wind, the course at Lake Breeze Golf Course in Winnecone, WI was in excellent condition for racing at the National Championships – firm ground, a mostly flat course with a few slight inclines/declines set things up for fast conditions. The women came into the meet ranked 8th by the USTFCCCA. They once again ran with great poise and patience to move up through the race. 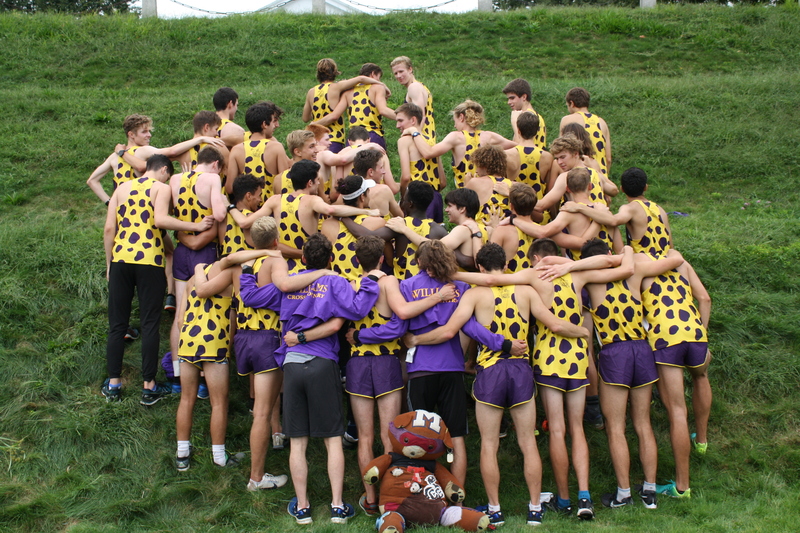 At the halfway point of the race, the team was sitting in 12th place with 382 points. However, there was a lot of racing left to come, and the 3-5 pack continued to charge their way up through the field. By 5k the team had moved up to 9th place, with Emma Hermann now leading the way. They managed to pass Middlebury and Wisconsin-La Crosse in the last 1000m to end up 7th overall, largely due to a strong kick from Freshman Grace Dailey, who moved up 23 spots in the last 1k! 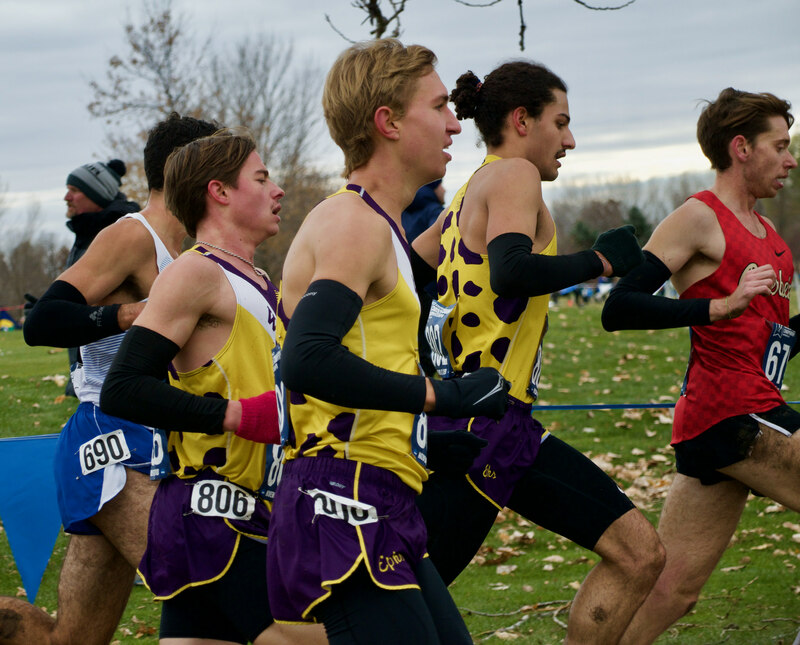 The Men were ranked 11th coming into the race, with hopes of moving up into a top-10 spot. As has been the case all year, Ryan Cox and Aidan Ryan quickly got themselves near the front of the race. The next pack of 3-7 runners were more patient and found their rhythm in the midst of the main pack. As the pace picked up at the front, the front group got smaller and small but Cox continued to hold on until suddenly the group was down to less than 10 runners. He summoned another strong kick to take 6th place overall in the race! Aidan Ryan finished 42nd, and then the next cluster of guys came right past the 100th place mark: Elias Lindgren (109th), Kevin LaFleche (128th), and Tristan Colaizzi (135th). The team took 8th place overall, with 300 points. With that, the 2018 Cross Country season comes to a close! Both teams had fantastic seasons, welcoming a lot of new young faces to the top groups, and are loaded up with a strong group of returners next year. 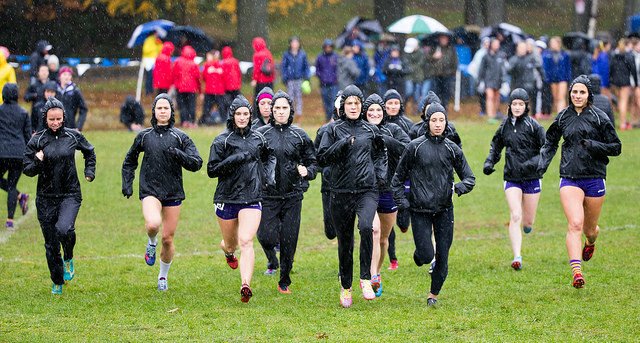 The NCAA Regional Championship for the New England Region was hosted by Bowdoin College in Brunswick, Maine. While the course was pancake flat, heavy rain the night before made for some sloppy and slower conditions – luckily we’ve had plenty of practice running through mud this season! The women lead off the day and executed what was likely their best race of the season up to this point. They ran patiently as the front of the race got off to an aggressive start, and moved up exceptionally well through the crowded field. 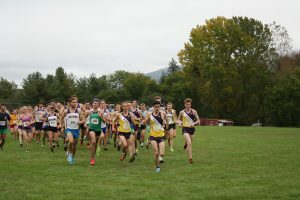 In the second half of the race, they quickly closed the gap on the top two teams, and almost caught conference rival Middlebury. In the end, they came out 3rd place, only 7 points behind Middlebury and 28 points behind MIT. 4 Williams runner earned all-Region honors by placing in the top 35 – Emma Hermann (13th), Emily Harris (19th), Audrey Rustad (20th), and Sarah Tully (26th). Freshman Grace Dailey closed out the scoring in 37th. The men followed the lead of their female counterparts with a great race of their own. They similarly did an excellent job of running as a team pack and moving up through the race. Ryan Cox and Aidan Ryan established themselves in the top group, and ended up finishing 5th and 6th overall (the top 1-2 pairing of any team in the race!). William McGovern fought hard to take 20th place, and served as a great guide for the following pack. Freshman Elias Lindgren was the next guy across the line in 26th, with Tristan Colaizzi right behind in 29th – all 5 scorers placed in the top 30 earning all-region honors, and the team placed 2nd overall which gave them an automatic bid to the National Championship. With the women earning an at-Large bid to nationals, both teams travel next week to Oshkosh, Wisconsin to take on the nations best teams! 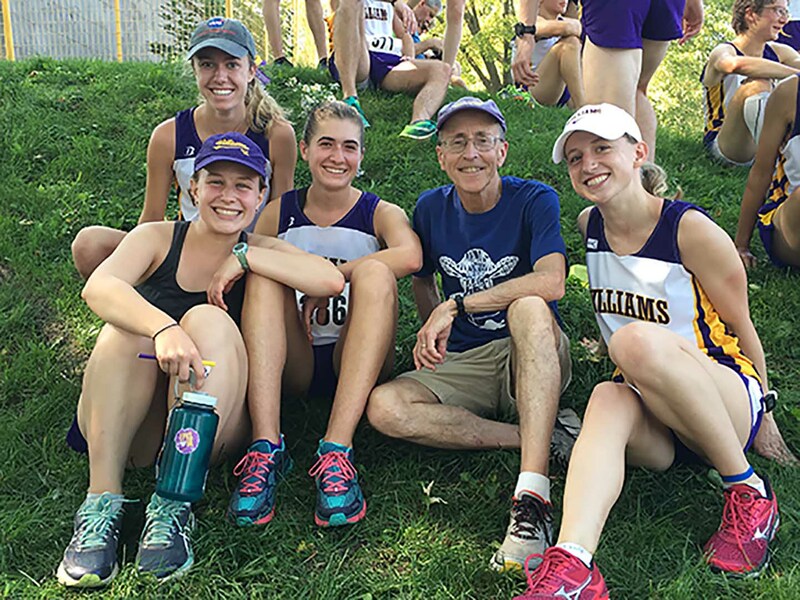 In what has seemed like a rare occurrence this year, the Ephs were greeted by sunshine when they returned to Franklin Park for the USATF New England Championship. This meet has become a staple of the Williams schedule, bringing together a mix of collegiate and club runners from all around New England. 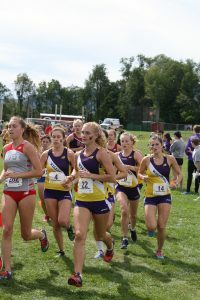 Despite resting the top 8 men’s and women’s runners, the Ephs competed well to take 7th in the Men’s 10k and 8th in the Women’s 6k. 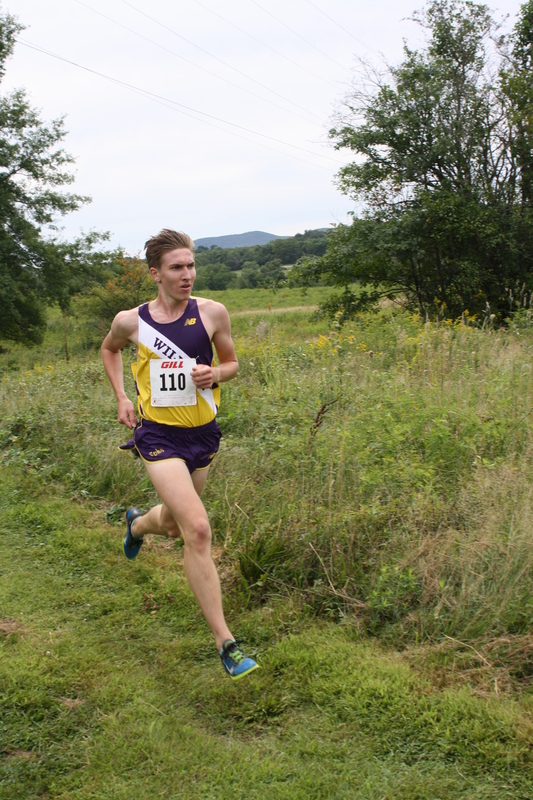 The men’s team was lead by Senior Jacob Kahrs, who came in 42nd overall with a time of 33:43. He was followed by sophomores Jake Lange and Sam Gilman, Senior David Azzara, and Sophomore Will Young. For many of that group it was their first time being in a scoring position for the team, and they competed well in a tough field. While the men were carried by a group of veterans, the women’s group featured a lot of new faces gaining great experience. 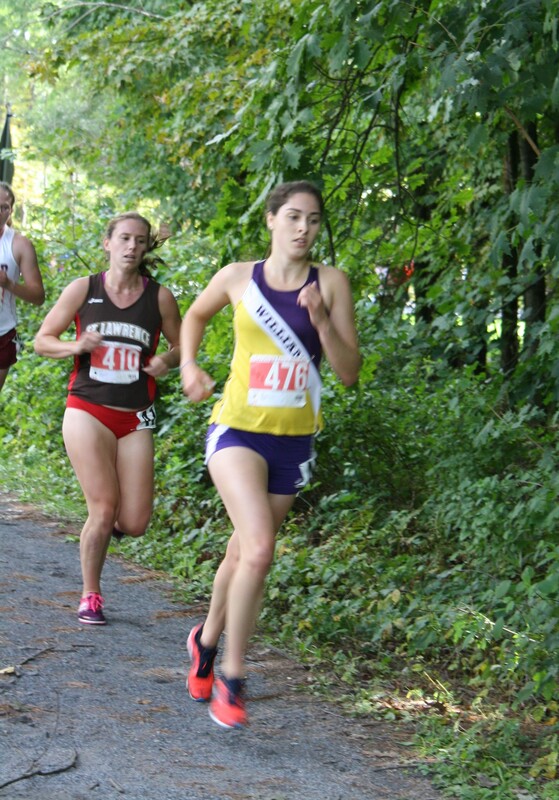 First year Abby Scott lead the way in 23:51, a 45 second improvement from her time on the same course last week. She was followed by fellow freshmen Sarah Jane O’Connor, Emma Tapscott, and Lauren Fossell, along with Sophomore Wyndom Chase. The end of the Cross Country season continues to approach rapidly – this weekend we travel to Bowdoin College for the NCAA New England Regional Championships, where we hope to qualify both teams for the NCAA National Championships the following weekend! For the first time ever, the NESCAC Championship was held at the historic course at Franklin Park in Boston, MA, hosted by Tufts University. The weather brought some race day schedule changes, moving the race times back two hours to escape the worst of the heavy wind and rain forecast for that day. The women were able to run under wet but relatively calm conditions, but the wind and rain picked up substantially during the men’s race. 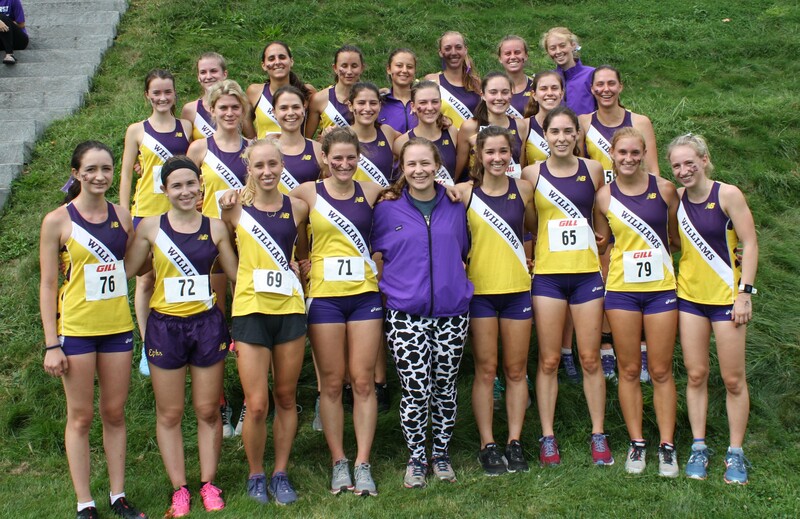 The women welcomed Audrey Rustad back to the course, which helped the team rebound back up near the top of the conference. They took second place as a team, lead as usual by the trio of Emma Hermann (6th overall), Emily Harris (9th) and Rustad (10th). 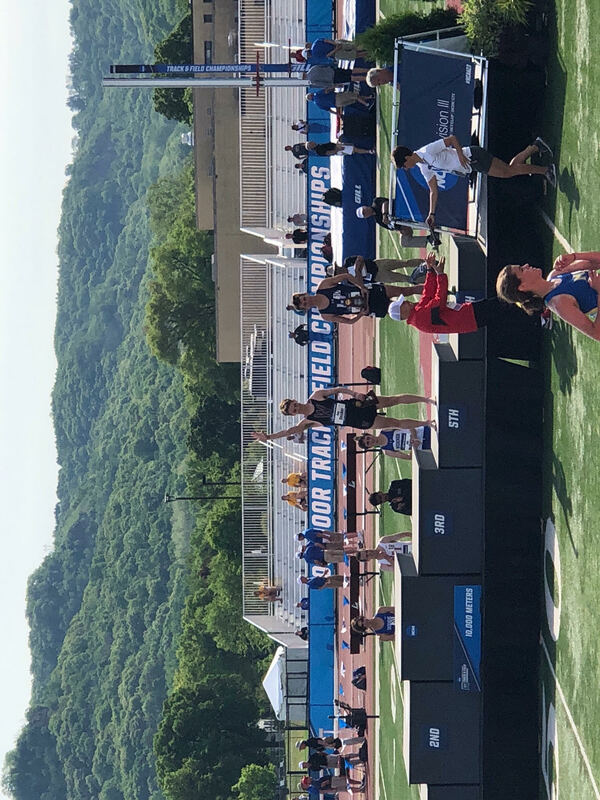 Sophomore Sarah Tully had a fantastic closing mile to take 20th place – Tully has continued each week to chip away at the gap between her and the top group, this week only coming in 12 seconds behind Rustad. 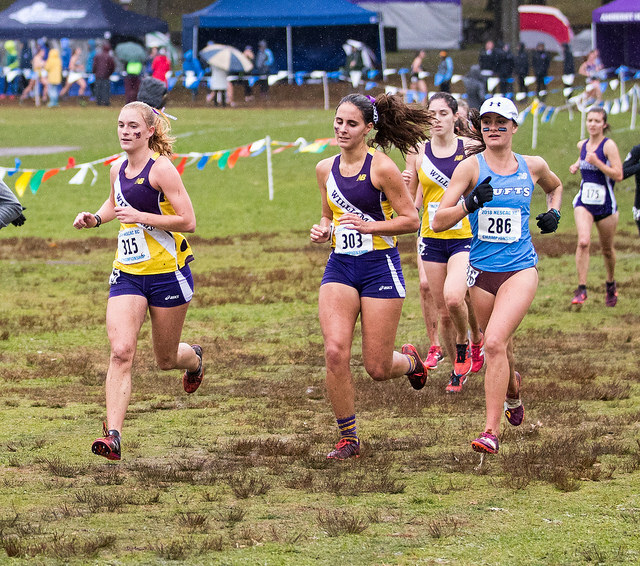 Freshman Grace Dailey held on well despite a tough fall in the mud late in the race, finishing 28th overall as the 3rd freshman in the race. In the end, they edged out Wesleyan and Tufts to take a solid 2nd place behind Middlebury. 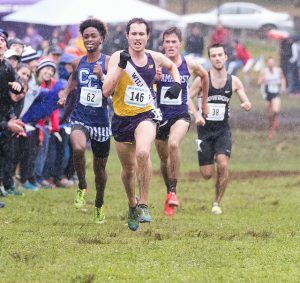 The men’s race was highlighted by the continued rise of junior Ryan Cox, who picked a great time to execute his first collegiate cross country victory. He found some speed to kick in hard the last 200 meters and hold off the other competitors. Aidan Ryan followed closely behind in 11th, and William McGovern was just outside the All-Nescac spots in 20th. 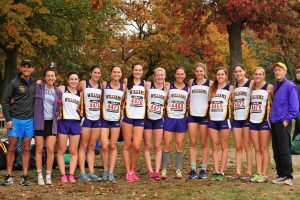 The strength of the team’s depth showed right after William – Ephs took 26th, 27th, 28th, and 29th to close out their top 7. 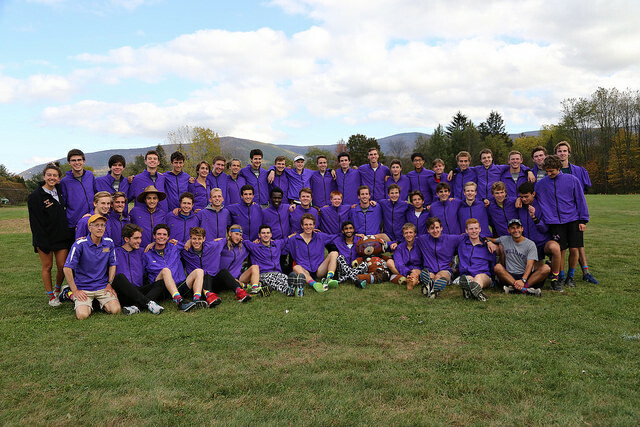 The team took 2nd overall, edging Middlebury by 2 points (the difference was made by the 6th and 7th runners, who edged Middlebury’s 5th to solidify the team score). Elias Lindgren, the 7th Eph runner, was the top male freshman in the race and thus won the NESCAC Freshman of the year. 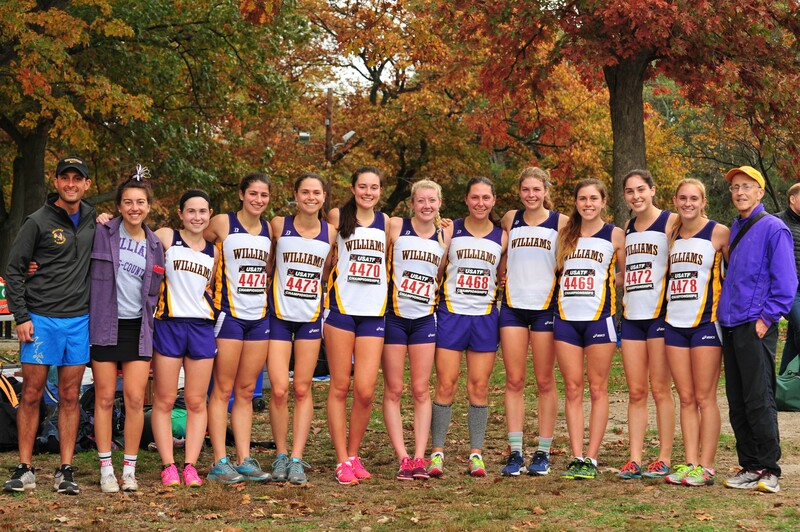 This Sunday, Williams will take the non-regionals team to the USATF New England Championships back at Franklin park, where the men will run the Championship 10k and the women will run the Championship 6k. 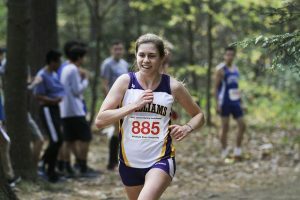 In the final meet before the start of the Championship Season, the Ephs competed at the Connecticut College Invite at Harkness Memorial State park, a beautiful course right along the Long Island Sound. 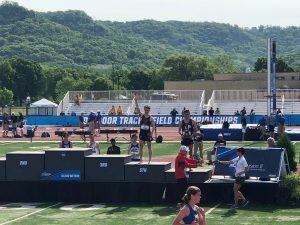 Over 300 athletes competed in both the Men’s 8k and Women’s 6k, with teams from all over the country coming to get some out of region competition. The women toed the line first, missing a couple key runners to illness, but ready to compete nonetheless. As has become the trend, the Ephs were lead by the junior-senior duo of Emma Hermann and Emily Harris, who came in 9th and 10th overall. 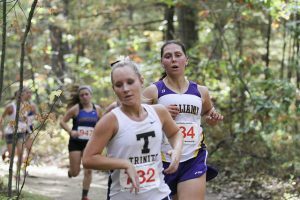 Each week, the next pair of Sarah Tully and Grace Dailey are inching closer to the top two, this week coming in 26th and 29th, just over 25 seconds back from Harris. The team welcomed some newcomers to the top 7 after that – Caroline Galo closed out the scoring in 42nd place, followed by Jaylan Fraser-Mines and Janelle Gowgiel. It was Galo and Gowgiel’s first time running in the top-7 this season! 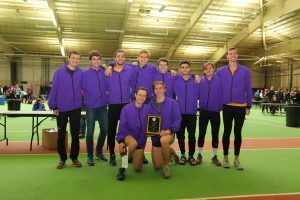 The team took 4th place overall in the meet, finishing as the 3rd NESCAC team. The men followed the women, on a slightly muddy slick course. Ryan Cox lead the charge, making a strong move just before 3 miles and opening up a gap on the entire field. He was chased down in the end by a couple runners, but held on for 3rd place overall. Aidan Ryan followed not far behind in 11th, then William McGovern and Sam Wischnewsky. Those 4 have established themselves as a consistent top group, taking the top 4 spots for the team in every 8k this year. Behind them, the team has cycled through a slew of different guys. This week, Elias Lindgren came across as the 5th man, in 25th place overall, followed by Lucas Estrada and and Kevin LaFleche. The team took 2nd overall, narrowly losing to rival Amherst by 4 points. 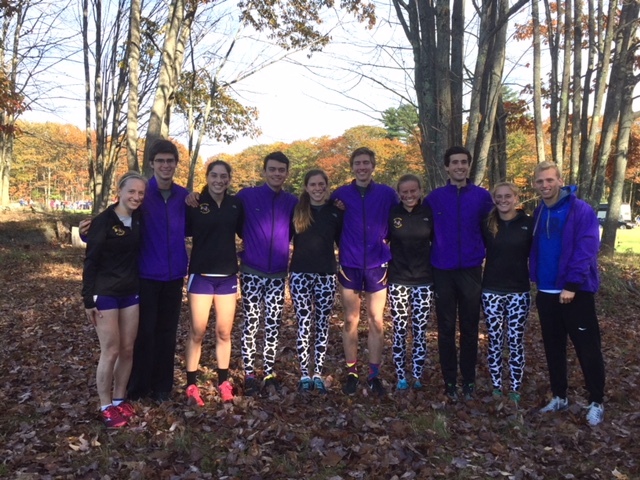 After an off week, the Ephs head to Franklin Park in Boston for the NESCAC Championships on October 27th! 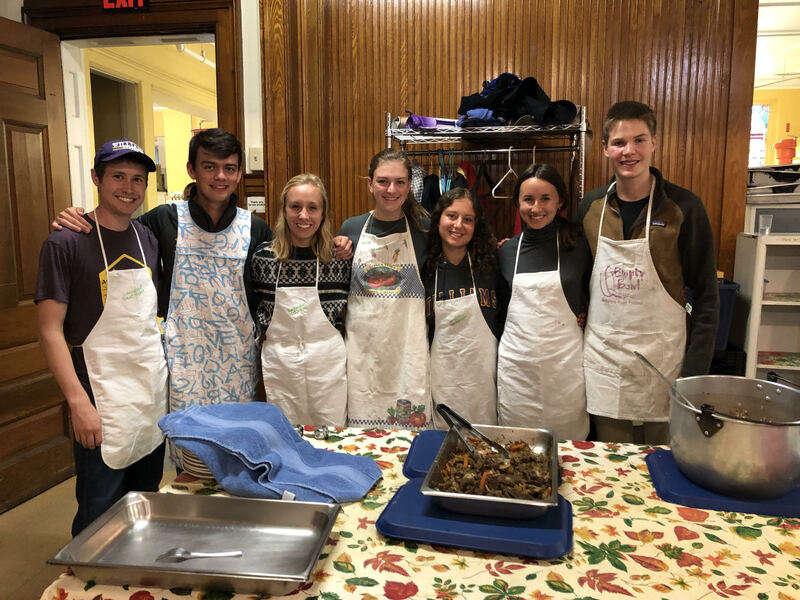 With a 5 day “weekend” from the combination of Mountain Day and reading period, the Cross Country team took advantage of the time off from classes to give back to the surrounding community. We took part in 3 separate service projects on Monday, working with some awesome groups that do a lot to support the people of Williamstown and North Adams. 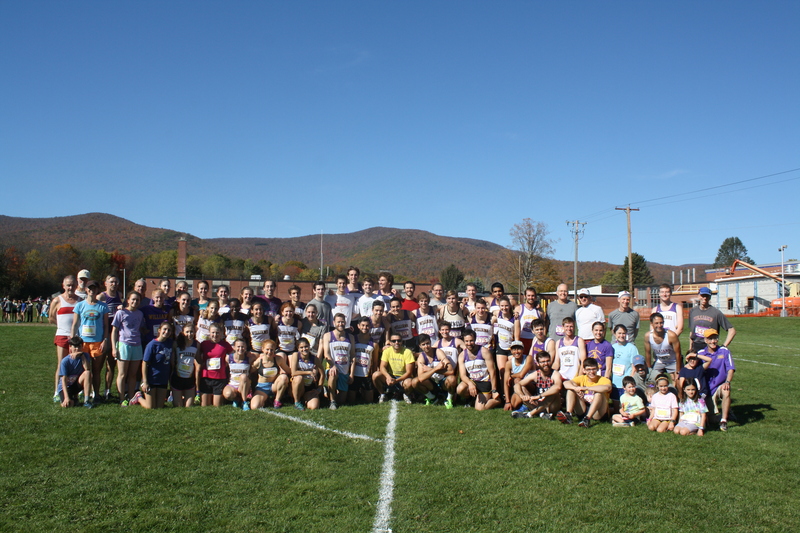 This past weekend, following a beautiful Mountain Day celebration on Friday, we welcomed back over 50 alumni and their families for the annual Williams Cross Country Alumni Race. 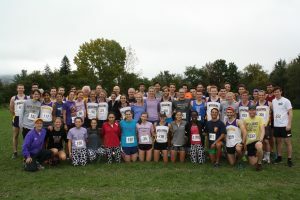 The alums arrived well prepared for the contest, taking substantial victories in both the men’s and women’s races – the male alums defeated the varsity 23-38, while the women’s alums had a perfect score of 15-50 over the current team. Peter Watson and Victoria Kingham took home the individual titles, in times of 16:27 and 18:18 respectively. More important than the outcome was the time spent together, reuniting alums with one another and sharing their past experiences with the present team members. 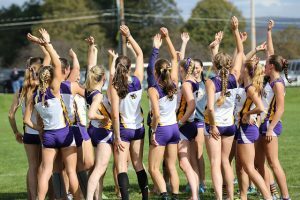 It also served as a great tune-up workout for the Eph runners as we prepare for the Conn College Invitational this weekend, our last meet before the post-season begins! The alumni group – thanks for coming back! The Ephs took on some inter-regional competition this past weekend at the Saratoga Invitational, hosted by RPI at the Saratoga Spa Park. 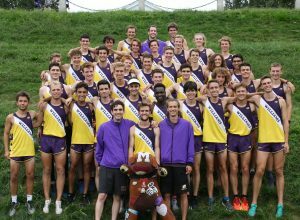 Both the men’s and women’s teams posted strong performances, taking a pair of second place team finishes. 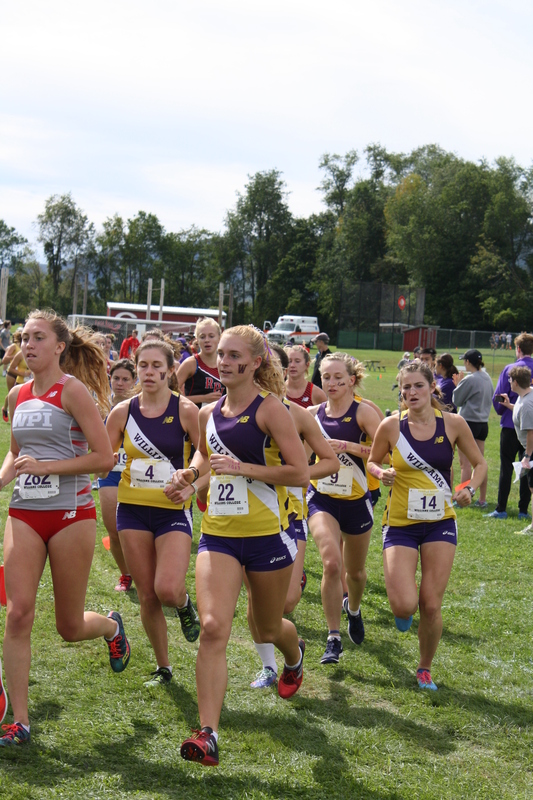 The women – lead once again by Emma Hermann and Emily Harris – came in just 9 points behind St. Lawrence. 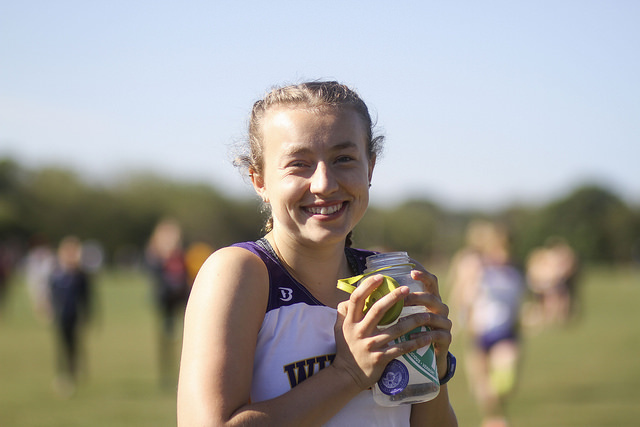 Freshman Grace Dailey followed up her PVC 5k title from last week with another impressive performance, finishing as the 3rd Eph runner and taking 15th overall in the meet. Sarah Tully and Erica Barrett rounded out the top 5 for the Williams Women. On the men’s side, RPI ran away with the meet, scoring 26 points. 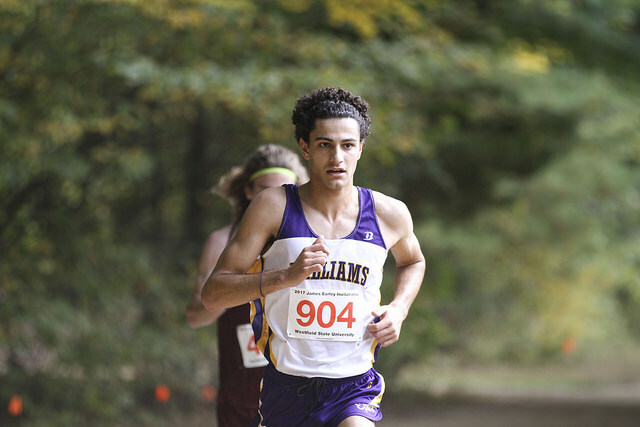 Williams finished a strong 2nd place with 65 points, well clear of 3rd place St. Lawrence. Aidan Ryan and Ryan Cox came in 3rd and 4th respectively, followed again by William McGovern and Sam Wischnewsky. Sam Gilman had the standout performance of the day, rounding out the scoring for Williams in 26th overall, his first time finishing in the top-5 as an Eph! Complete results of both races available here. 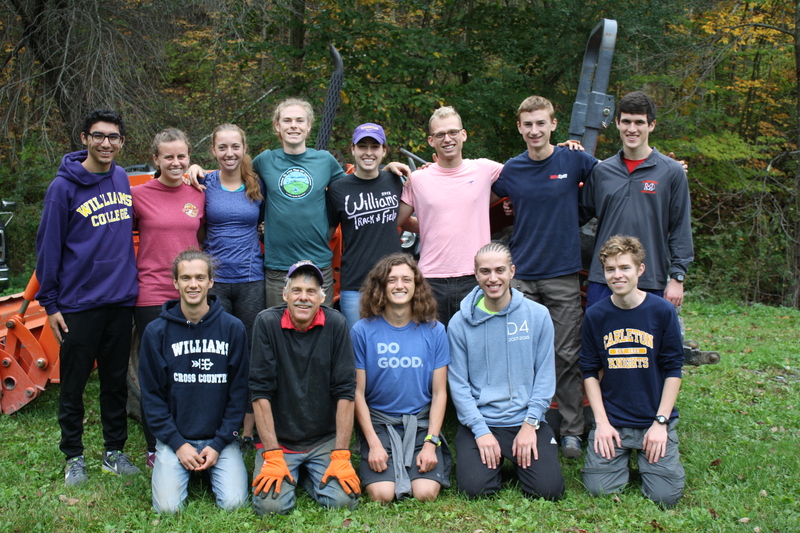 Next week will be the annual Williams Alumni Meet at Mount Greylock HS, race starts at Noon – hope to see you there! The Ephs hosted the Purple Valley Classic this past weekend at Mount Greylock HS, and posted strong performances in all 3 races. The male and female teams in the 5k, composed primarily of freshmen, took 1st place overall as teams and also had the individual champions, Elias Lindgren and Grace Dailey. 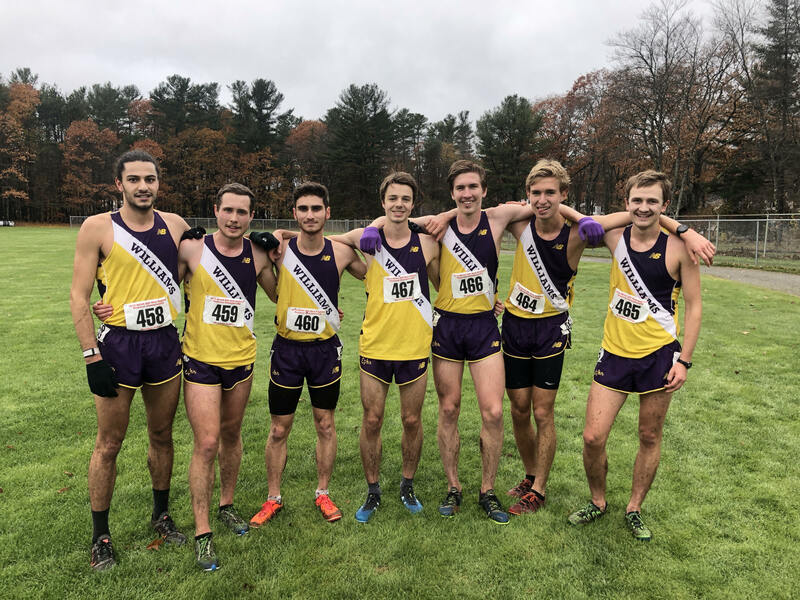 In the varsity race, the men ran an impressive and confident 8k race, defeating some of their New England region competitors to take 2nd place overall, behind a very strong RPI team. Aidan Ryan, Ryan Cox, Will McGovern, and Sam Wischnewsky all posted top-10 finishes. 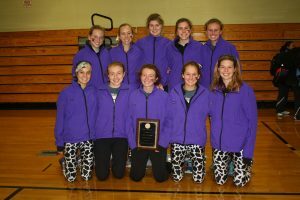 The women took 2nd place in the varsity 6k, helped by a strong lead pack of Emma Hermann, Emily Harris, and Audrey Rustad, who ran together for much of the race and finished the race in the top 13. They also took down some other great teams that we will see again at NESCACs and regionals. Start of the men’s race, mountains in the background! 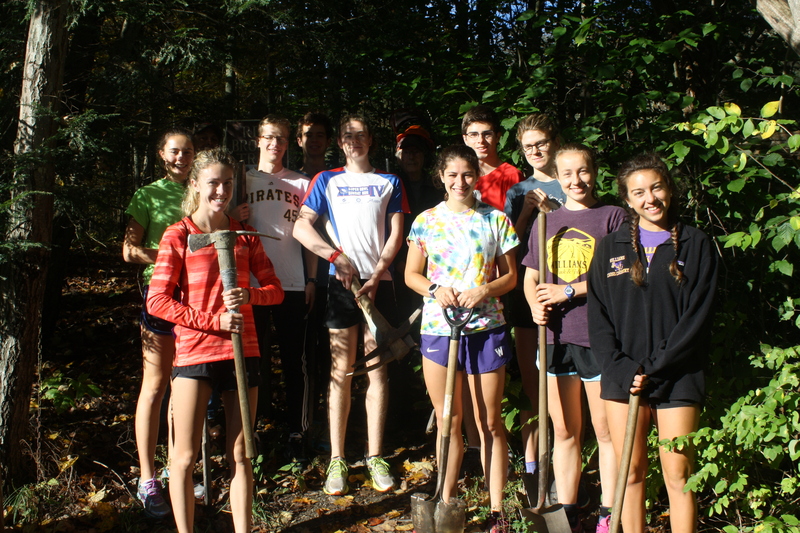 Another Williams XC tradition took place last weekend, the running of the co-ed relays. 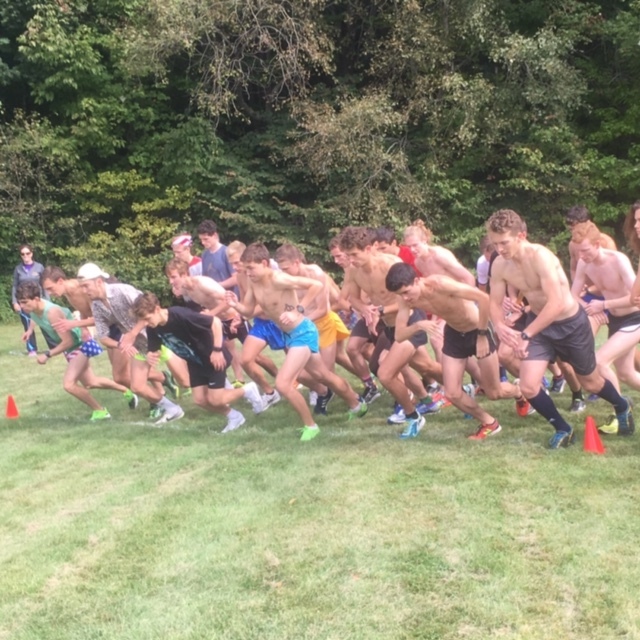 Pairs of men and women run a mix of 3k and 2k loops for a challenging workout and fun intra-squad competition. One of the highlights of the run is the costumes, which each pairing coordinates around a theme of their choice! Here’s a picture of the team gathered before the workout. Here’s a picture from the finish of our Annual Mount Greylock Run. 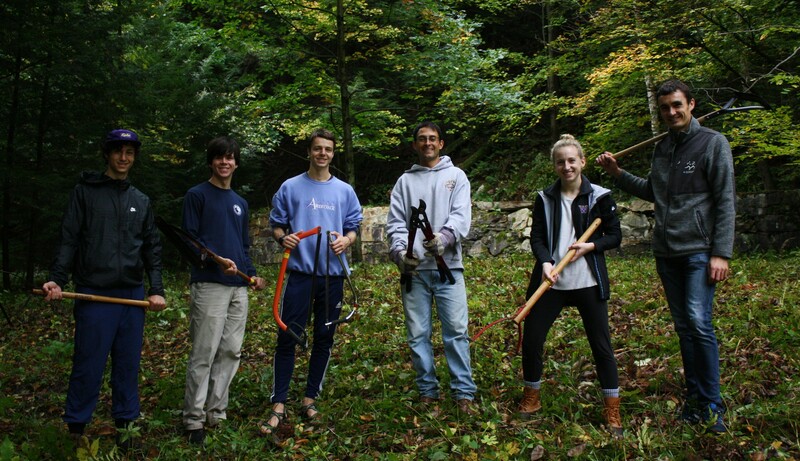 The team runs the full length of the 8 mile auto road to the summit of Mount Greylock, the highest point in MA. 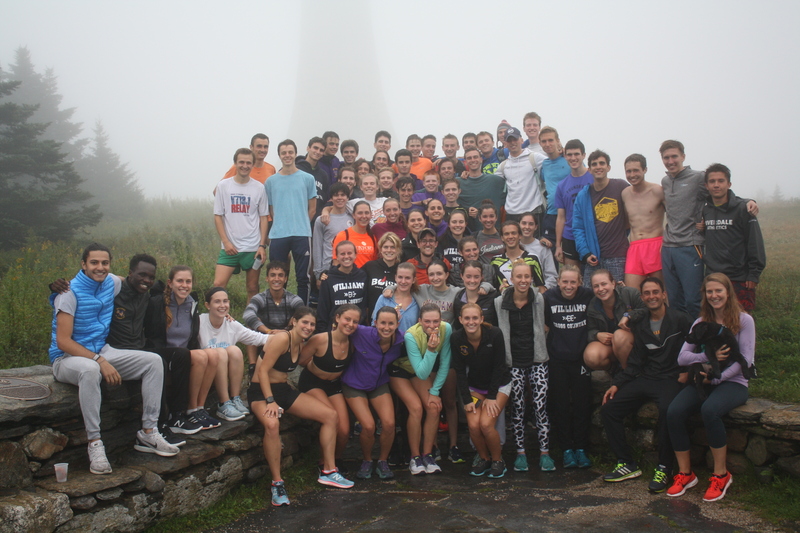 The mountaintop was covered in clouds this year – but we had a great workout tempoing through the fog! 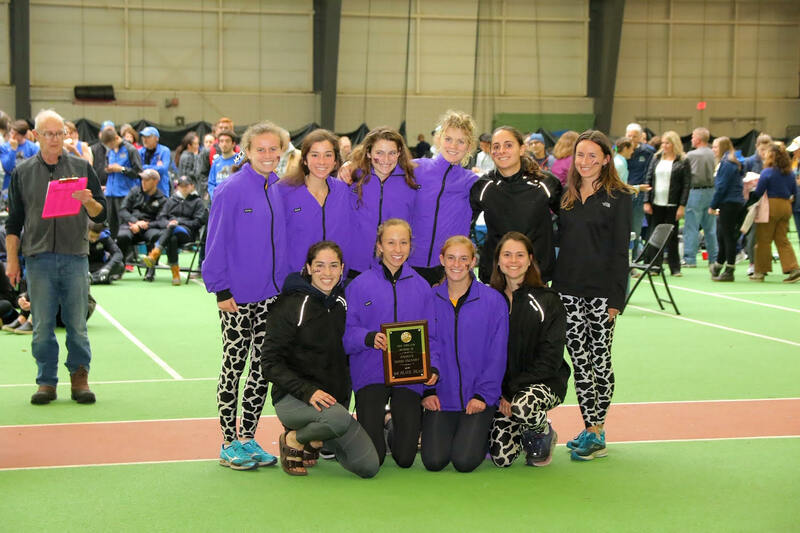 The Ephs traveled south to Amherst College for the Little 3 Championships this past Saturday, September 8th. It was a calm cool day, finally giving the runners some relief from the summer heat and humidity. Dry weather left the course firmly packed and ready for racing. 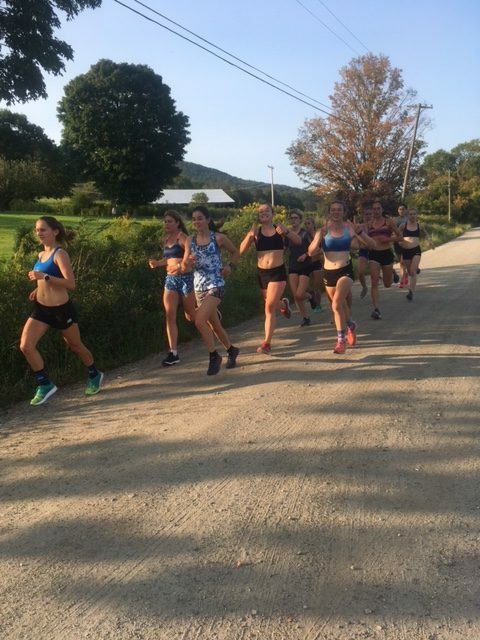 The women raced a 4k and the men ran 6k, both a little shorter than the typical race distances, which provided an opportunity to shake the rust off of from a long summer away from racing. 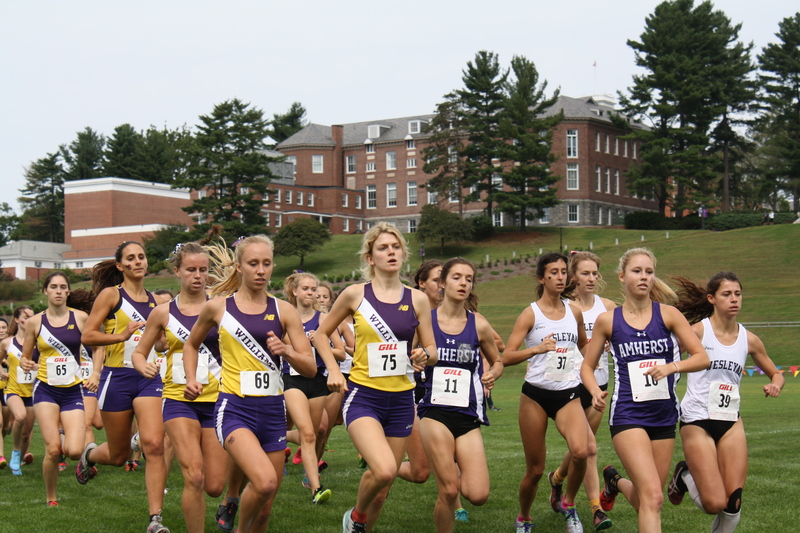 The women lead off the day, reacting to a strong early pace set by the Amherst runners. Captain Emily Harris ‘19 and Audrey Rustad ’20 brought the team through the first mile, which was mostly downhill, in 5:33. They were followed by a strong pack of underclassmen. 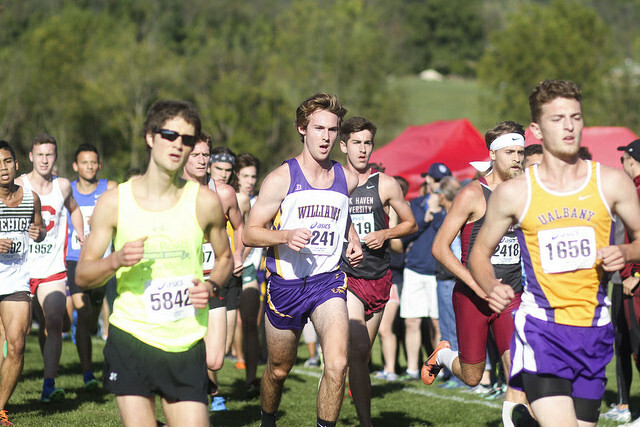 Through the second mile, the Amherst runners began to fade, but at the same time Wesleyan mounted a strong charge up the main hill on the course. Emma Hermann ’20 caught up to her teammates and formed a strong front pack of 3 Eph runners. 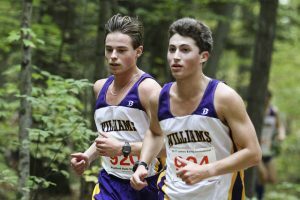 In the final kilometer, it became clear that it was a tight show-down between Williams and Wesleyan. 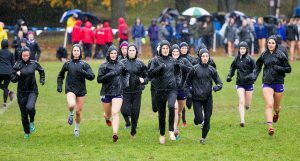 With the top Wesleyan woman leading the race, and the 2-4 spots locked down by the Ephs, it became a battle between the two packs to take the edge in the final scoring positions. The sophomore duo of Jaylan Fraser Mines and Sarah Tully ’21 ran a smart, patient race and slowly moved up through the field, eventually taking the 4th and 5th scoring positions for Williams, and 11th and 13th overall in the race. Grace Dailey ’22 also managed to displace Wesleyan’s 5th runner, helping the Ephs pull out a close 3 point victory over Wesleyan, 30-33. 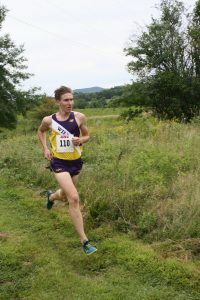 The men’s race got off to a more conservative starting pace, and Aidan Ryan ’21 (pictured below) took control of the field, establishing a 3 second lead over the field by the 1 mile mark. 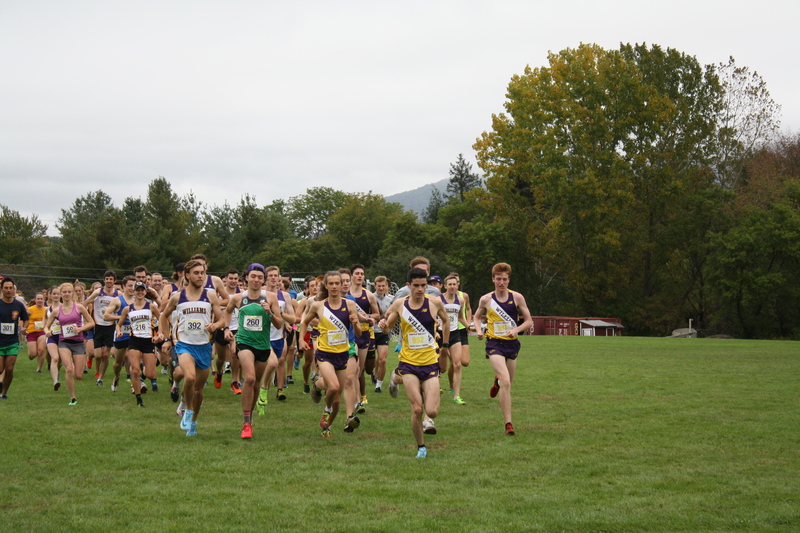 After passing the mile, a very experienced group of Amherst runners established themselves at the front of the race, attempting to maintain and eventually close the gap on Ryan. Lucas Estrada ’20 and Kenny Marshall ’20 pulled the Eph pack through the early part of the race, keeping them in close contention with Amherst. They were followed by 9 Eph runners within a 5 second spread at the mile. 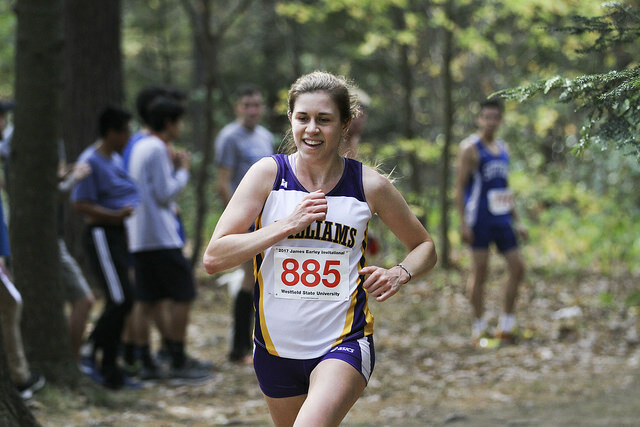 As the race wore on, the Ephs managed to take control of the second pack in the race. Newcomer Elias Lindgren ‘22 had an excellent debut, breaking away catch a faltering Amherst runner and finishing 5th overall in the race. Ryan Cox ’21 came in right behind Lindgren in 7th. 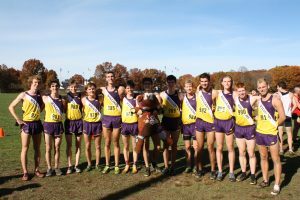 Not far behind, the stampede of Ephs came through, led by Sam Wischnewsky ’21 and Mitch Morris ’22. Much like their female counterparts, Wischnewsky and Morris managed to run patient races and moved up very well over the course of the race to snag the critical last two scoring spots and pull themselves ahead of the Amherst 5th runner. While it was not enough to unseat the reigning Little 3 Champion Amherst Mammoths, Williams gave them a good run for it, falling short by only 5 points in a score of 27-32. Next weekend the Williams Cross Country team will enjoy a week off from competition, but will have the annual intersquad “Co-Ed Relays” on campus on Saturday. 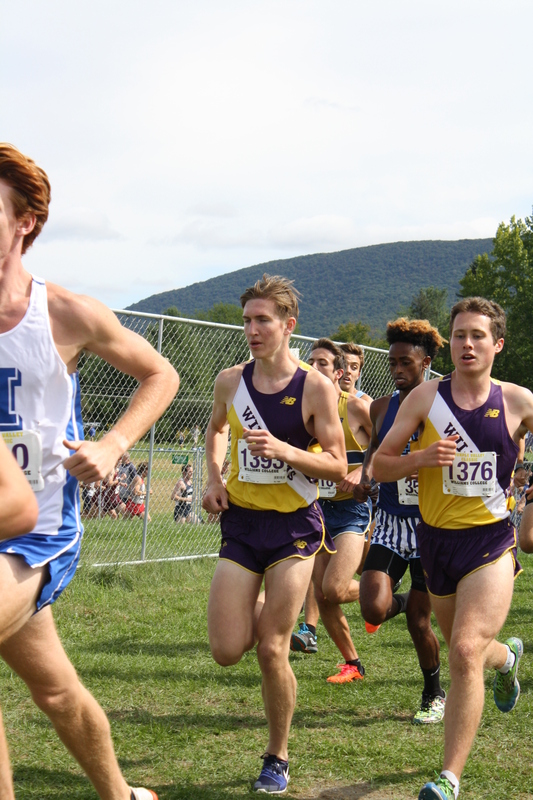 The next meet will be the Purple Valley Classic hosted by Williams College at Mount Greylock HS, which will feature excellent completion amongst many of the best Men’s and Women’s teams in New England! 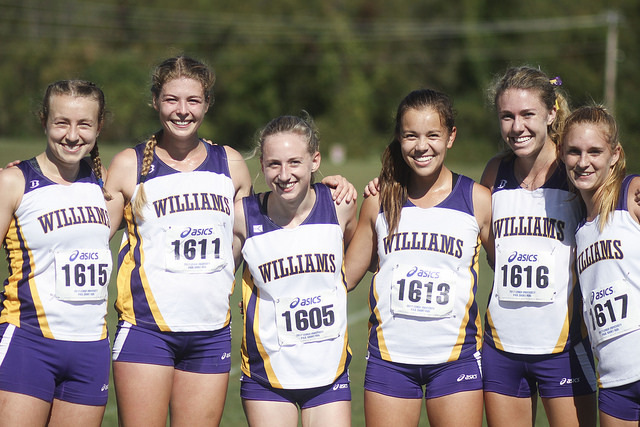 Almost immediately following the close of the Cross Country season, Williams’ track season launched into action! 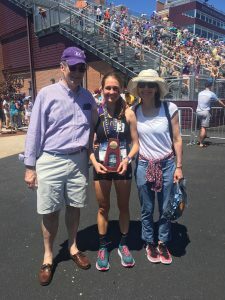 From December thru May, our athletes competed in, first, Indoor, followed by Outdoor meets, often against some of the best athletes in the NESCAC, region and/or country. 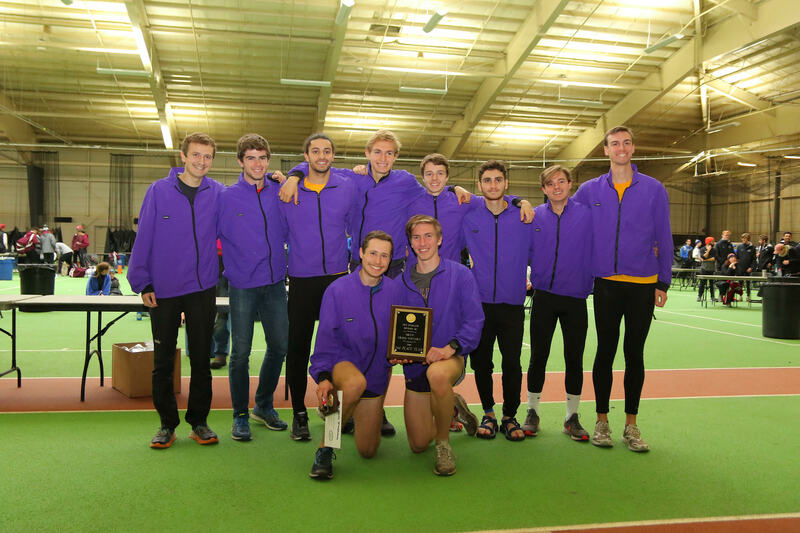 Through months of cold & trying training conditions, the Ephs persevered to earn 1st for the women and 3rd for the men at the Indoor Division 3 New England Championships. The season culminated with the Mid-Distance and Distance squads putting forth 5 individual + 1 relay qualification for the Div. 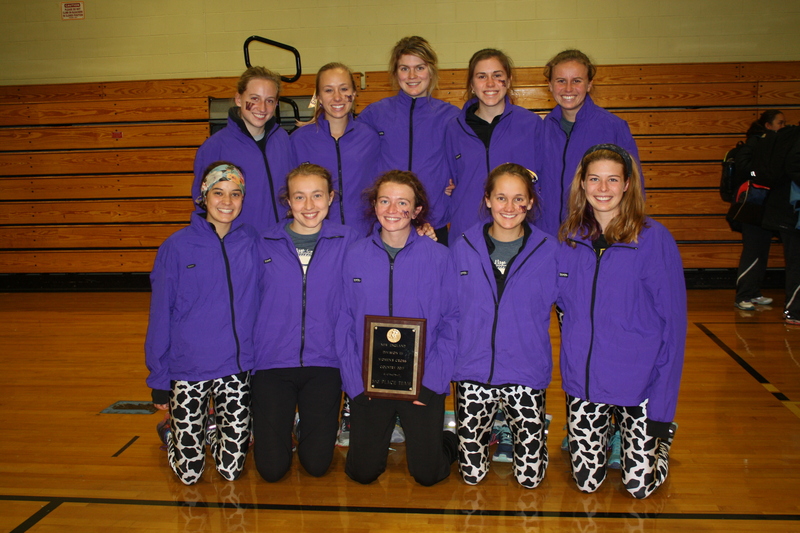 III Indoor National Championship meet, at which the Women’s Team garnered a 2nd place finish overall. Outdoors kicked off with a fun and productive team Spring Break trip to San Diego, which was followed up by a season full of personal and team growth, as demonstrated by the Mid-Distance and Distance groups having had individuals posting PR’s at every single meet of the season!! This positive momentum led to 1st and 2nd place finishes for the Women’s and Men’s teams at NESCAC Championships, respectively. Williams topped things off at the Div. 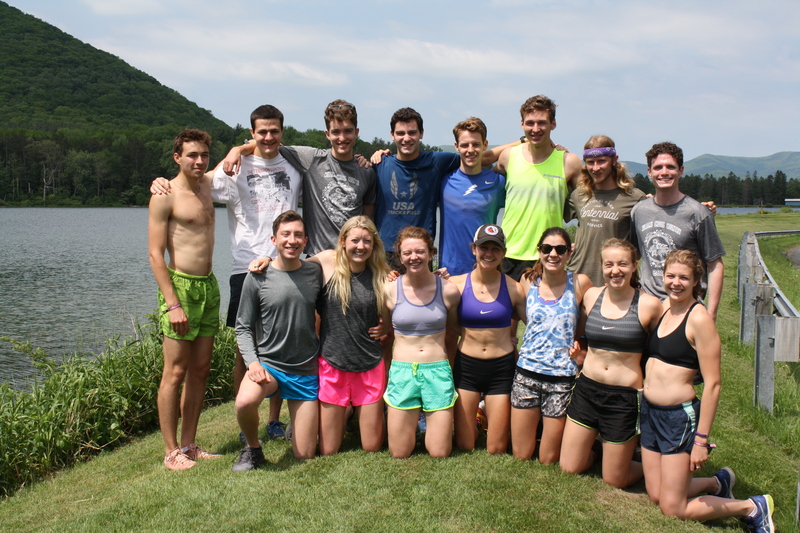 III Outdoor National Championships with 8 individual qualifiers from the distance-oriented crews, 5 of whom finished Top 8 in the nation and earned All-America honors! 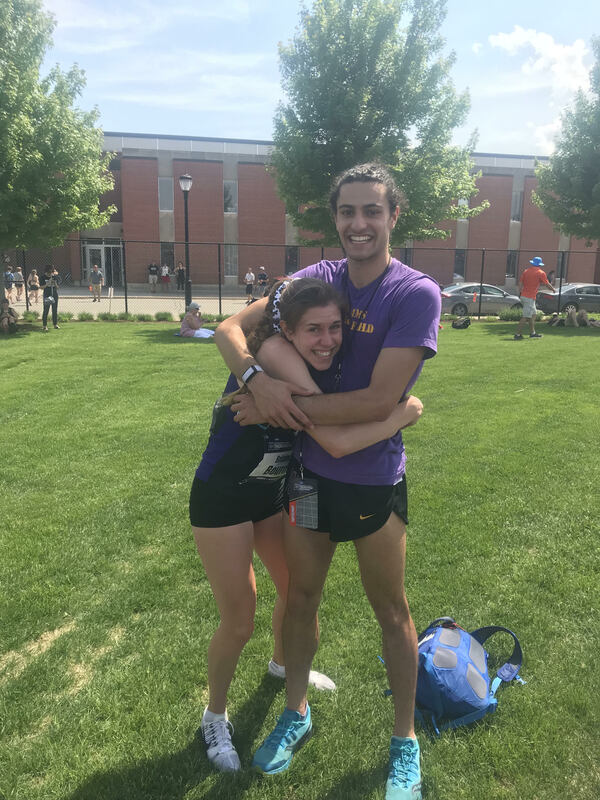 The completion of the track season also meant the end of our seniors’ collegiate careers, and thus some very difficult (but hopefully temporary!) goodbyes. As in true Williams fashion, a large group of seniors from both Track and XC gathered for a fun run up the tallest mountain in Massachusetts (Mount Greylock). Greeted at the top with snacks and photo ops, the seniors soaked in their 4 years’ worth of accomplishments together, reminiscing on their seasons and other fond memories. They officially graduated from Williams this past Sunday and have since departed campus to embark on their next journeys! We wish them all of the best and thank them sincerely for their dedication, hard work, perseverance, and smiles. Happy t(r)ails, Ephs! senior squad at their Mt. Greylock Fun Run! 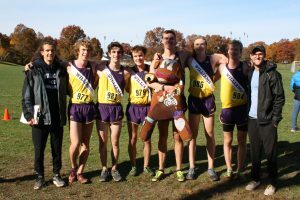 November 18, 2017 – Division III National Championships! 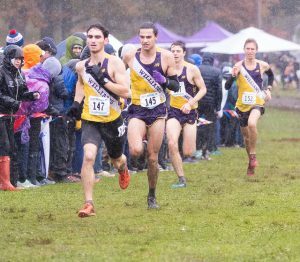 The 2017 Cross Country Season has officially come to a close with the National Championship meet this past Saturday! After months of pouring blood, sweat and tears into their training, the team reaped the rewards as they competed against 31 of the nation’s best teams in Elsah, Illinois. 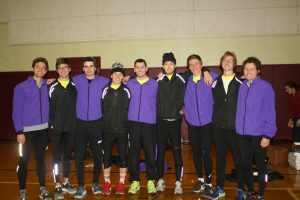 As has been our usual fashion this year, the Ephs persevered against all challenges thrown their way (25 mph winds and a 25-degree temperature drop in the span of 2 hours) to perform well when it mattered most. The women’s team earned 8th place, outperforming their 9th place USTFCCCA rank and maintaining their 6+ year streak of placing top 10 at NCAA’s. 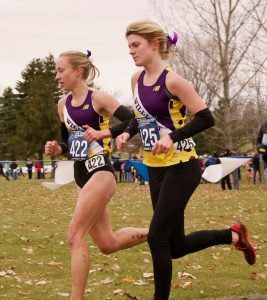 Both Victoria Kingham and Audrey Rustad garnered All-America honors, finishing 24th and 37th respectively. 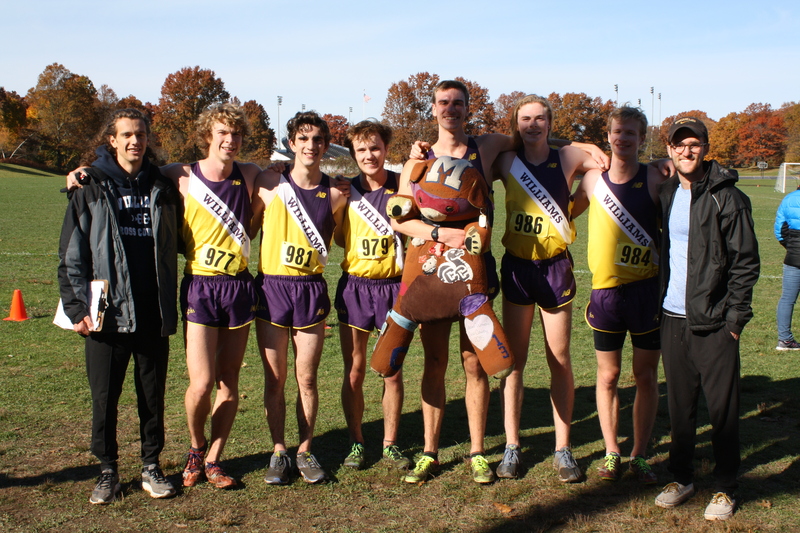 The men’s team snagged 13th place, 9 spots ahead of their pre-race ranking. The finish was a nice cap on their continuous race-to-race improvement throughout championship season. 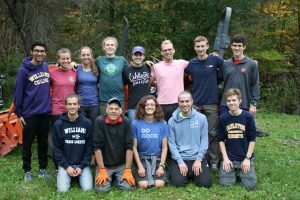 Thank you to all of our athletes who have tirelessly committed themselves to their seasons, helping to uphold all that is Williams Cross Country. Also, thank you to everyone who has supported us every step of every mile. Until next year…Go Ephs! November 11, 2017 – New England Regional Championship! The NCAA Division III New England Championship took place at Gorham Country Club, hosted by the University of Southern Maine. 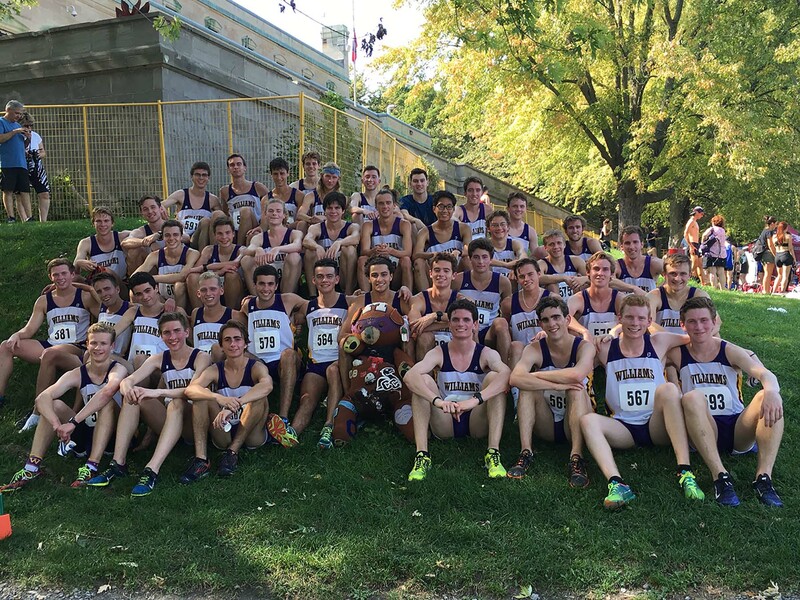 55 men’s teams and 56 women’s teams participated, totaling 763 runners across the board. Though winds were a bit gusty and temperatures were a bit chilly, our squads didn’t let the weather affect them and produced solid performances in both the individual and the team scoring. Their efforts paid off, with both genders earning at-large bids to the NCAA Division III Championship next weekend! 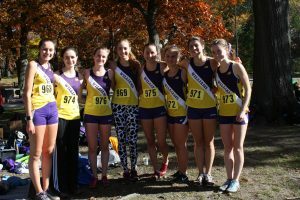 The Lady Ephs raced first, taking 3rd overall behind MIT and Tufts with 4 of our 7 competitors earning All-Region honors. 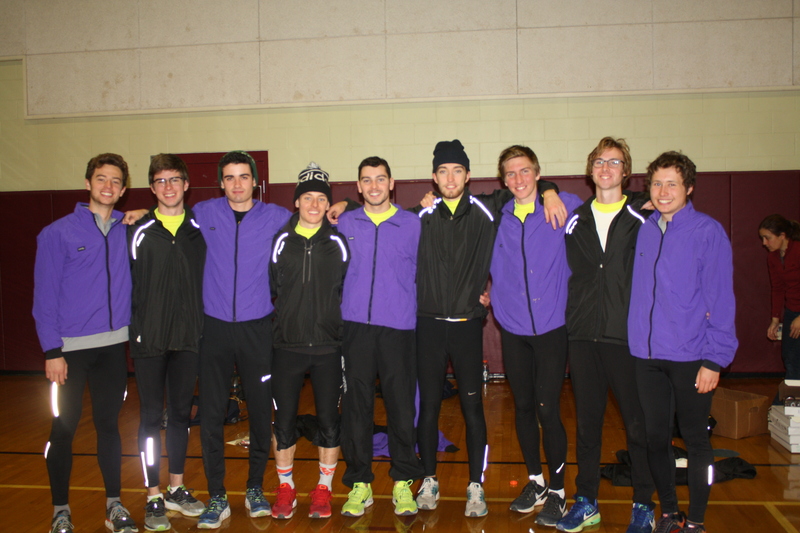 On the men’s side, the team placed 4th overall, just 13 points shy of 3rd place Middlebury, also with 4 All-Region honors. With the good news of receiving at-large bids, everyone is looking forward to next weekend with positive mindsets, excited about and thankful for the opportunity to try to put all the pieces together at the Big Dance. November 5, 2017 – USATF New England Championships! 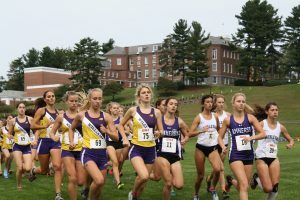 The USATF New England Championships brought a unique opportunity for our athletes to compete against post-collegiate runners! 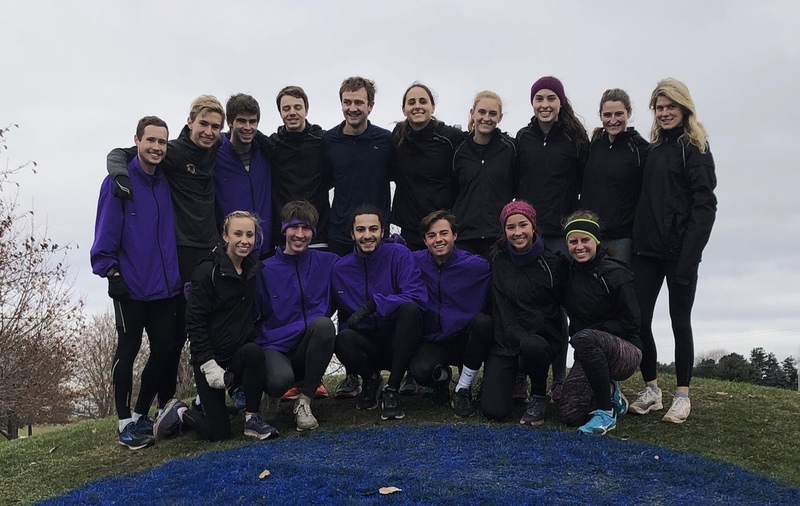 29 Ephs, both men and women, made the trek to Franklin Park in Boston, where blue skies and temperatures in the upper 50s made for an ideal race conditions. 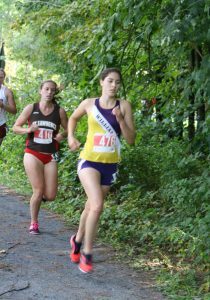 Eliza Matt, senior, led the way for our women’s squad, covering the course in 23:19 for 37th place! Close behind her were junior Tyra Wynn and freshman Brianna Bourne and scoring 38th and 45th, respectively. Janelle Gowgiel (sophomore) and Jaylan Fraser-Mines (freshman) rounded our top 5. 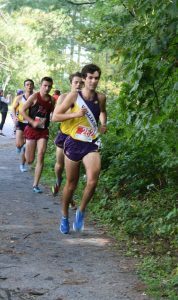 As for the men, William McGovern, sophomore, was the men’s leader, placing 33rd and running 32:54 for the only cross country 10k race of the season. Kenny Marshall (44th), Jake Kahrs (51st), Sam Gilman (56th) and Chris Avila (64th) were our 2-5th runners, each of whom ran just over or below the 34-minute mark. The group’s energy was positive from start to finish as the race brought many of our competitors’ seasons to a close. We are proud of all of our Ephs & their performances, and we’re looking forward to this upcoming weekend’s Regional competition at the University of Southern Maine! 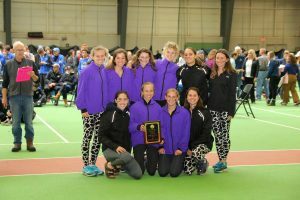 October 28, 2017 – NESCAC Championships! This year’s NESCAC Championship took place on Bates’ home course, Pineland Farms. Full of rolling hills and wide dirt paths, the course is challenging and keeps runners on their toes as they wind through the woods. 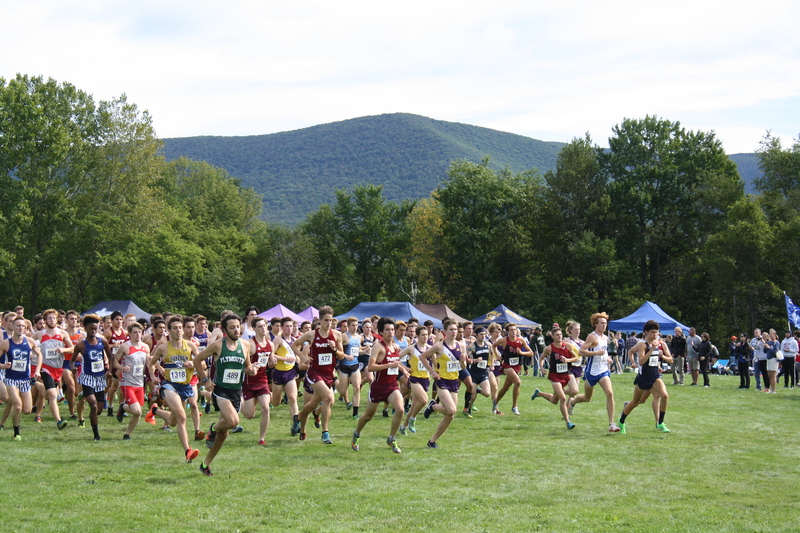 One of the more competitive conferences in the area, the NESCAC provides excellent competition, against which our teams went up against under blue skies this past Saturday. 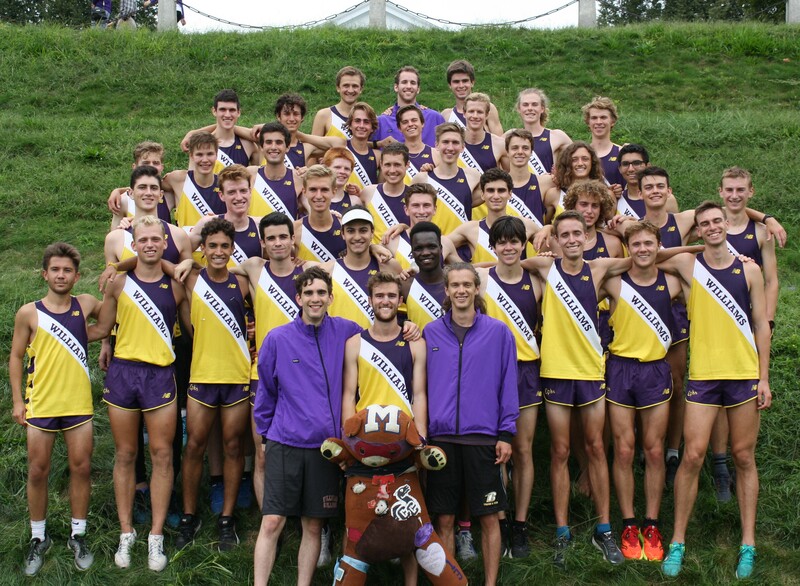 Our women’s and men’s teams finished 1st and 5th respectively, with outstanding performances on both sides. For the men, Ryan Cox had a fantastic race, placing 15th and coming in second for the team. 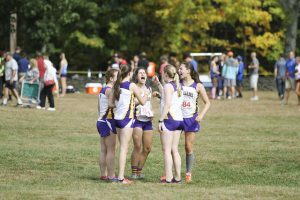 On the women’s side, Stella Worters, Emily Sundquist and Emily Harris all had great days for the Ephs, stepping up on the day. We’re proud of all of our runners who competed, as well as our alternates, who have continued to train hard and push one another along. This upcoming weekend we’re excited to be shipping up (over) to Boston to have a group compete in the USATF New England meet at Franklin Park on Sunday morning! 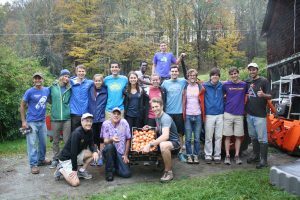 October 21, 2017 – Plansky Alumni Race! The Purple Valley welcomed back alumni of all ages this weekend in honor of our annual alumni event! 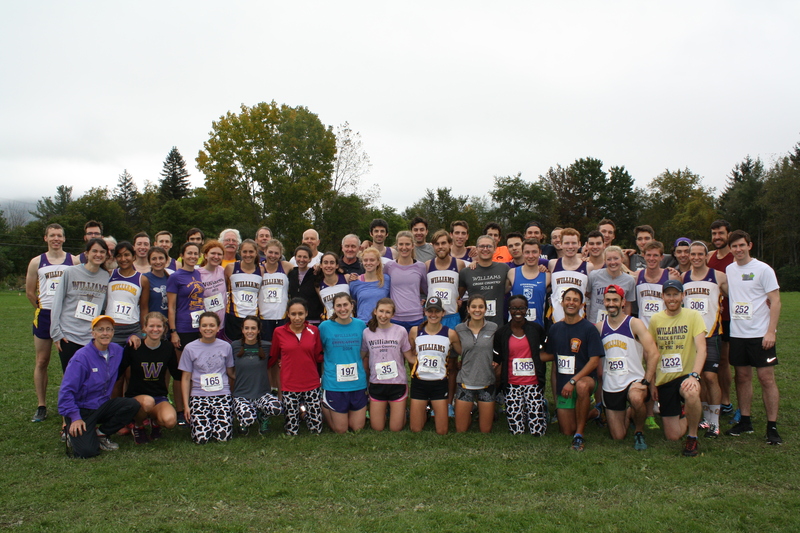 Ephs young and old, past and present, came together on a beautiful Saturday morning to compete against one another, a large group of our current athletes, a small group of Williams’ Nordic Skiers and four other college cross country teams. There were approximately 150 participants who took part in the co-ed 5000m race, while many others lined the course and cheered everyone on. 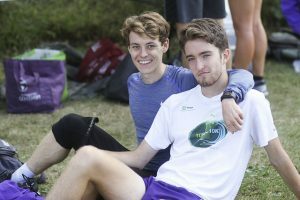 After the completion of the race, there was a wonderful picnic at which people were able to reunite and catch up with old teammates, coaches and friends. We’d like to take this opportunity to send a heartfelt thank you to Pete’s wife, Yumi, for making this picnic (and all other home meet meals) possible with all of her hard work! We’d also like to thank everyone who made the trip out to Williamstown this weekend; we appreciate your continued support and were glad to have you back! As many alumni as we could gather up prior to the start of the race! October 14, 2017 – Little Three Championships! This past weekend our team took part in, and had the privilege of hosting, a longstanding tradition – the Little Three Championships! 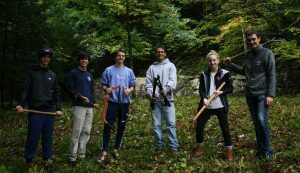 The race brought together three rivals (ourselves, Amherst and Wesleyan) in some friendly (…but not too friendly) competition on the trails of Mount Greylock High school. The women won their competition, going 2-3-4-5-6, with some excellent, competitive efforts from top to bottom. The men placed second in their race, with 12 of our men comprising the majority of the top 20 overall competitors. The women’s team gears up for the start line. 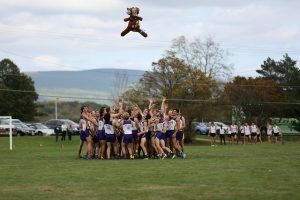 The men’s team sends T Bear soaring. Parents and supporters of the team came out to line the course and cheer us on in our endeavors, which we really appreciate! It was great to see everyone come together and enjoy one another’s company at our post-meet picnic. Next week will bring another opportunity for reunion as we’ll have some alumni coming in to compete with us at the Plansky Invitational! October 8-10, 2017 – E(ph) for Effort: Community Service Projects! The long holiday weekend brought around a perfect opportunity for our team to give back to the community and be a part of various service projects throughout Williamstown! 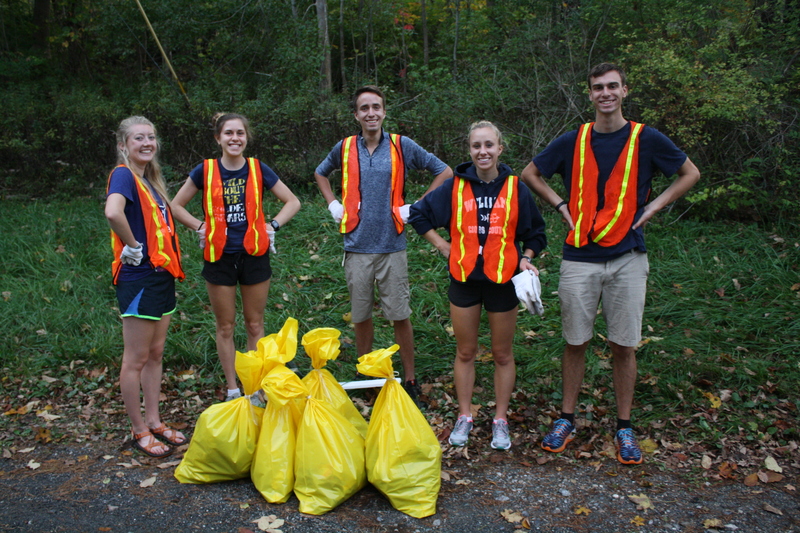 On Sunday we had a group of team members participating in our adopt-a-highway cleanup crew on Route 43. Donned in the brightest of safety vests, some of our Ephs braved the rainy day to help to clear out trash from the roadsides. 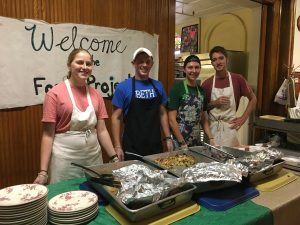 Monday offered up two different projects, one at the Peace Valley Farm and the other at the Berkshire Food Project, both of which provided assistance to organizations that provide food to members of our community on a daily basis. 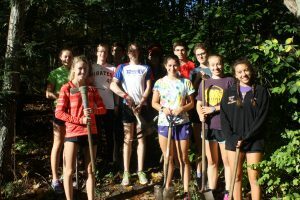 The skies cleared up on Tuesday, allowing a group to help the Rural Lands organization to rebuild some trails, dig out a river and transport small-ish boulders around, all in an effort to better and preserve Williamstown trail systems. 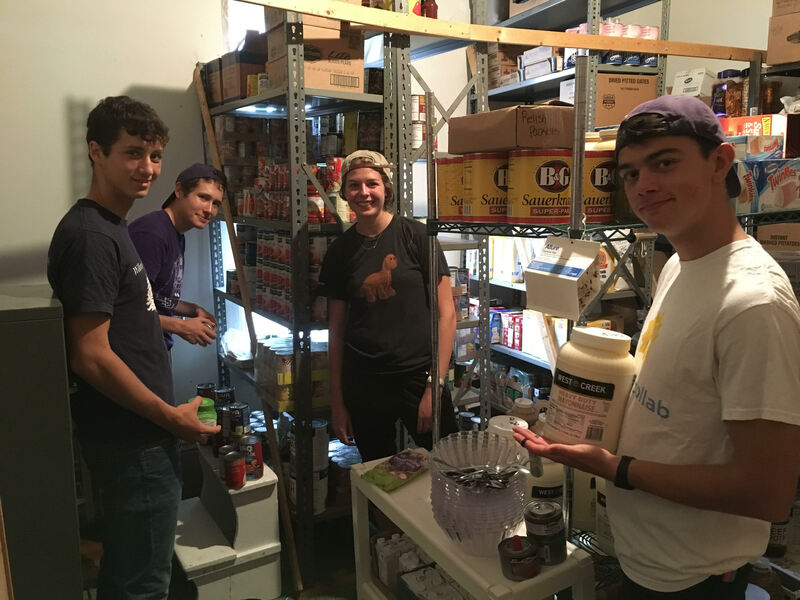 Thank you to all of our team members who put forth their time, energy & service – Go Ephs!! the Peace Valley Farm crew! 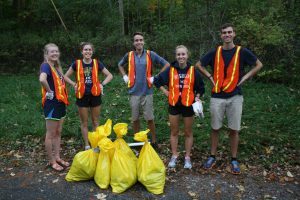 our stretch of adopted highway has never looked better thanks to these troopers! October 7, 2017 – Westfield’s James Early Invite! 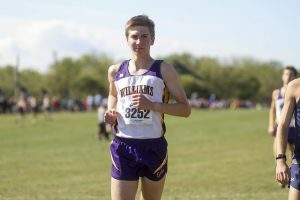 Williams stayed in-state this weekend to compete at the James Early Invitational which, for the first time, was split into multiple races to account for increasing numbers of entries. Both the men and women had participants in each of the four races, with the men covering 8km of fields and trails and the women running 5km. The men kicked off the day with a team and individual win in the Blue race, with Kevin LaFleche taking the victory and leading 6 men in the top 10. The White race brought a 2nd place finish as a team, with Tristan Colaizzi making his season debut and finishing first for the team, helping to put 5 in the top 25. Kevin & Zach lead the way in the Men’s Blue Race! 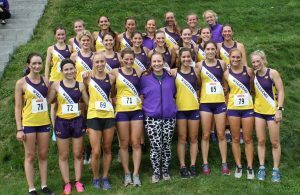 The women’s races followed, with our Lady Ephs putting up a 7th place finish in the White race and a 9th place finish in the Blue race. 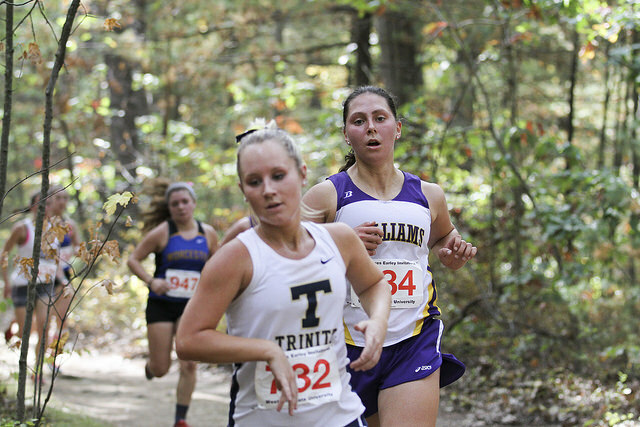 Freshman Brianna Bourne led the way for the women in the White race, placing 7th, while Adrienne Banks did the same in the Blue race, notching 26th overall. Adrienne prepares to make a move on the trails! Everyone was proud of the efforts put forth, and we are looking forward to next weekend when we can get all of our team members out on the same starting line at the Little Three Championship! one of the most emphatic pre-race cheers the game has ever seen!! September 29, 2017 – Paul Short Invitational! 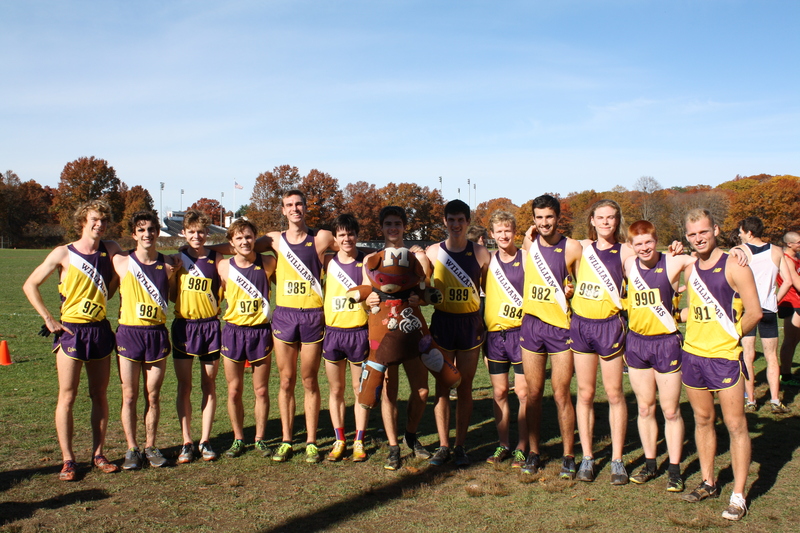 Friday morning brought perfect conditions for the Ephs to toe the line in Bethlehem, PA on one of the quickest courses that they’ll run on all season. Amongst teams from all over the country, our athletes faced stiff competition but put out a strong showing for our program. The men in the Open Race kicked off our day with some really positive energy, posting a 58-second spread between our 1st and 10th runners! Nick Gannon, sophomore, had a huge PR of a minute and a half, finishing first for the team and leading the way for various other PR’s and 8k debuts. The women’s Open Race had senior Emily Sundquist continuing her cross-country comeback campaign as the first team finisher, leading a minute and four-second spread between our 6 competitors, who also had some personal bests and debuts as well! Our Gold Race male competitors finished with a 32-second spread from top to bottom, led by freshman Aidan Ryan who completed the 8k distance for the first time in his career. The men packed up well to navigate the quick-moving field studded with nationally-ranked Division 1 programs. Our women’s Gold Race counterparts were led by Victoria Kingham with her massive 42-second PR and followed up by 6 other women who fought hard throughout the duration of their 6000-meters, working together to push each other along. Aidan Ryan prior to his 8k debut! Next weekend brings a shorter road trip to Westfield, where those who did not compete at Paul Short will put their training to the test! 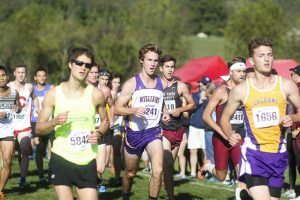 September 23, 2017 – Purple Valley Classic! In the midst of the continuous late-September heat wave we’ve been experiencing, the Williams XC squad hosted our biggest PVC meet to date this past weekend. With 29 teams in attendance, it was a great opportunity to mix it up with some new and different competition. There were Williams runners in each of the 3 races (5k, 6k and 8k), with solid performances all around! 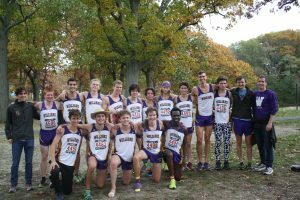 Up against some of the top Division III competition in the nation, our men’s team placed 5th in the 8k and our women’s team placed 4th in the 6k. 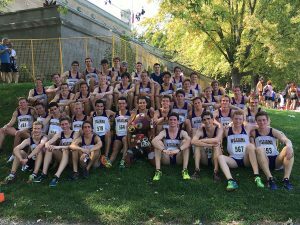 As for the Co-Ed 5k, the Ephs were able to place 11 men in the overall Top 15 of the race and 7 women in the Top 10 of female competitors. Up next is the Paul Short Invite at which we will compete against some of the country’s top programs across all three NCAA Divisions. 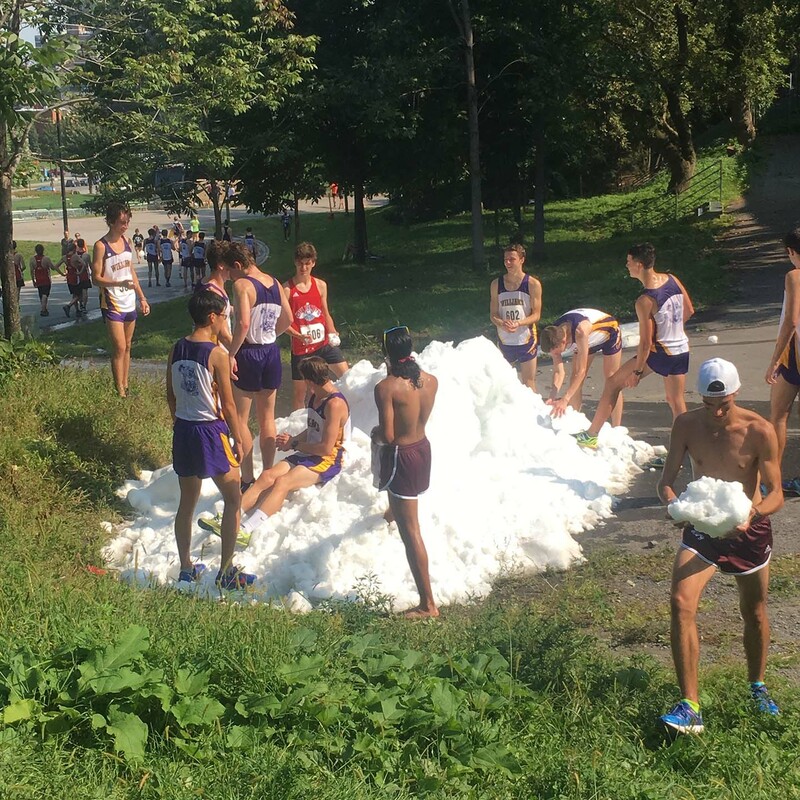 September 16, 2017 – McGill Invitational! This past weekend we had the opportunity to travel up to the Great White North in the name of our season’s debut race at McGill University. As the only American team in the race, it was a great chance to mix things up internationally and get the competition officially underway! 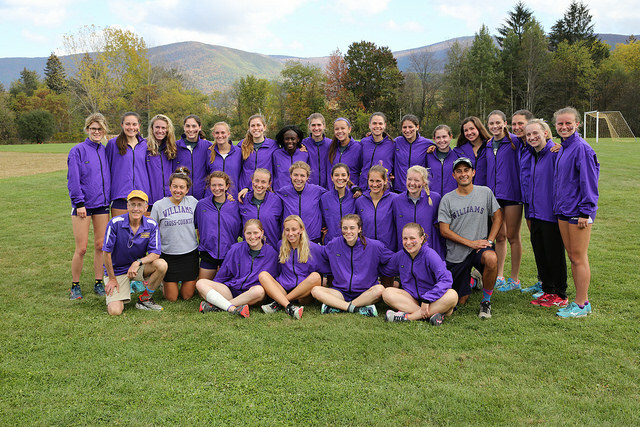 The women’s team claimed second place, led by senior duo Anna Harleen and Victoria Kingham. 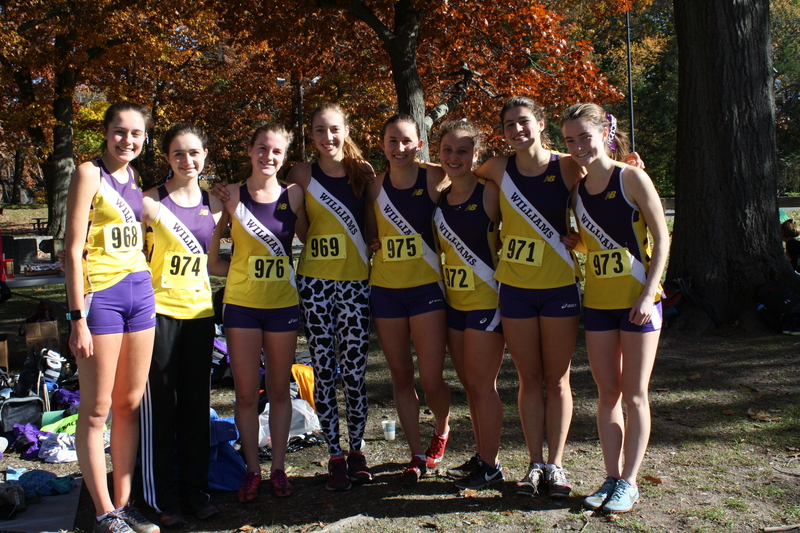 Assisted by a standout performance by Audrey Rustad, the Lady Ephs put 8 in the top 30 competitors! The men’s team walked away with a clear 25-point win, putting 8 men in the top 20. Senior Liam Simpson led the charge and was followed closely by freshman Aidan Ryan, junior Austin Anderson and senior Ben Decker. Despite some unusually hot temperatures, each of the teams showed great promise and camaraderie, with various packs working together throughout the duration of the race. After the race the team was able to explore Montreal a bit, trying different restaurants and enjoying some time along the river. It was a marvelous experience all around and a great lead up to the Purple Valley Classic this upcoming weekend! Post race photo op with Coach Pete! 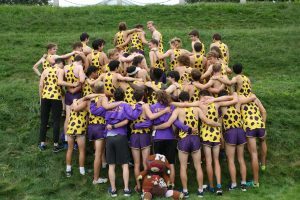 The men’s squad gathers up with notorious T.
September 9, 2017 – CoEd Relays! Saturday morning brought miles of smiles, and a good amount of sweat, as the team gathered up for their annual CoEd Relays event! Donned in coordinating costumes, 31 different teams of 2-4 members took to the newly modified course at Mount Greylock to compete against (and champion for) one another. Spirits were high and the energy was pumping as everyone put out some great effort and got the ball rolling for the 2017 season! Glad to keep up the notorious tradition, and can’t wait to keep things going next weekend up in Montreal! The men get the relay started with their first 3k leg! Thumbs up as the women pass by!